César Franck was famous as a composer of instrumental music. In contratst to this he also composed church music, but unfortunately his work as a church musician has fallen into oblivion. The mass, which was completed by Franck in 1860 and performed for the first time on Easter Tuesday of 1861 in Ste. Clotilde, was revised by him time and again until 1872. 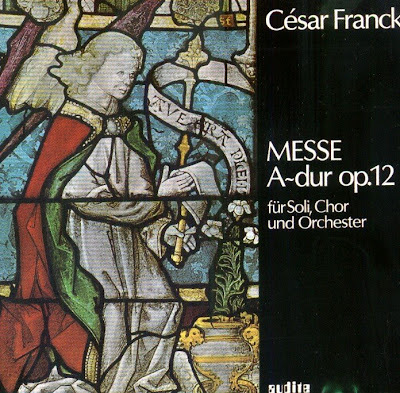 In its arrangement for the choir and the soloists, the mass dispenses with the alto part, in keeping with a custom often to be observed in France. The role of the vocal solists is of absolutely secondary importance in comparison to that of the choir. Only for the Qui tollis of the Gloria is a solo tenor prescribed, whereas the Et incanatus est of the Credo and the beginning of the Agnus Dei can be performed by soloists ad libitum. And yet musically speaking there are good reasons for delegating larger portions of the composition to the soloists so as to reach a higher degree on tonal differentiation as well as to make its formal structure come out more clearly. This attempt was made here in the recording of the work. The CD was released by AUDITE, 1993, (ADD). Audite 95.431. Recording fom 21th November 1979 in Heilig-Kreuz-Münster, Schwäbisch Gmünd.